If you are returning to WriteAtHome and already have an active Parent/Observer account, skip to number 2: Learn Where to Get Help. If you enrolled after August 11, 2018, your Canvas Parent/Observer account has been created for you, and your login credentials are the same as your Parent Enrollment Account. 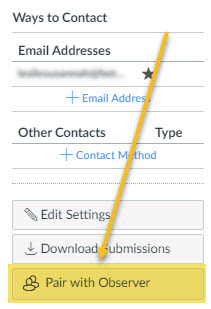 You can also skip to number 2: Learn Where to Get Help, but we recommend logging in to Canvas (click Canvas Login above) to confirm your account is active. 1. Go to the WriteAtHome/Canvas Login page (You can get to this page by clicking login from our main menu above). 2. Login using your student's username and password. 3. Go to Account > Settings. 4. On the right, click Pair with Observer. 5. 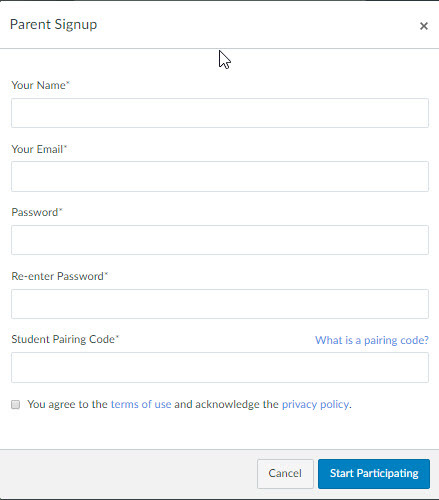 Copy the Pairing Code. 6. Logout of your student's account (Account > logout), which will take you back to the WriteAtHome/Canvas login page. 7. Click the link in the upper-right corner that says, "Parent of a Canvas User? Click Here for an Account." *If you have more than one student taking a WriteAtHome or Wasko Lit course, please see question 3 on our Canvas FAQ page for directions on how to connect them to your parent/observer account. We also recommend getting the FREE Canvas Parent App from the iTunes store. It's available for iOS and Android and is very useful. Here's a link to helpful information about the app and how to use it. 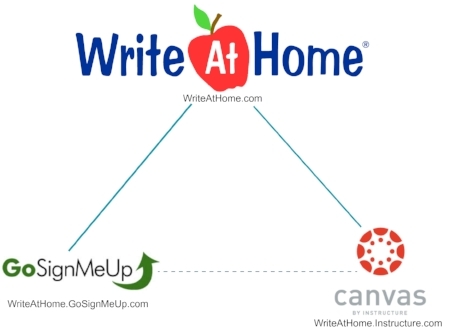 WriteAtHome partners with two online programs to help us provide our services: Canvas, by Instructure, and Go Sign Me Up. All the course material and work takes place in Canvas (writeathome.canvas.com). Enrollment and course registration happens in Go Sign Me Up (writeathome.gosignmeup.com), which integrates with Canvas. 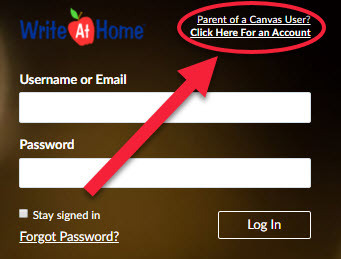 When a parent enrolls a student in a WriteAtHome course, they create an account with both Go Sign Me Up and with Canvas. The student also gets an account with both sites. You can access either using the same username and password. It's not likely you'll need to login to Go Sign Me Up other than to enroll in courses. Students and parents will often login to Canvas, however, to participate in our courses. WriteAtHome.com is our home site. It's mostly for marketing. It's where we tell people about what we do and answer their questions. You can reach our customer care department from there too. WriteAtHome.GoSignMeUp.com is where you go to sign up for our courses. Once you have an account there, you can login and see your history of courses, payments, etc. There's no need to ever login to our Go Sign Me Up site other than to enroll in courses, but it's there if you want to. It's accessible from our site by clicking Enroll Now. WriteAtHome.Instructure.com is the site where our courses happen. It's where students login to participate in their course. It's also where parents can login to track their students' progress and communicate with their writing coach. Instructure is the company that runs the Canvas program. You can get to this site by clicking Login on the WriteAtHome site. Before beginning your course, we recommend you spend some time going over the information provided on our WriteAtHome-Canvas FAQ page. Information about contacting your writing coach, accessing feedback, downloading papers, and more can be found on this page. There are several videos linked on the left side of the FAQ page. You won't regret taking time to watch them. For general help about Canvas, you can visit the Canvas Guides knowledge bank. 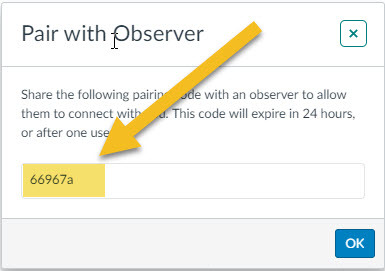 Students should search the student area, and parents should search in the observer section (Parents are considered "observers" in Canvas). You should bookmark these pages for future reference. You will hear from us via email as the start date approaches. If you have any questions, in the meantime, please feel free to contact us.